June is a strawberry month in England. You get tasty strawberries in all the shops but sometimes I drive out to a farm to pick them myself. Strawberry picking always reminds me of the summer holidays when my cousin, sisters and I used to do this with our grandmother. The farm I go to here hasn’t only got the strawberry fields but grows a selection of other fruit and vegetables that can also be picked, such as courgettes. As you may have seen in one of my previous posts that courgettes make a great cake ingredient – quite like carrots. So to mark the courgette and strawberry season I decided to make some cupcakes featuring both. Each cupcake hides dollop of strawberry jam inside and I’d suggest using only the best jam here, ideally a home made one as they tend to contain more fruit (if you go for a shop bought variety, I would recommend St Dalfour). The receipe is actually based on a gluten free receipe I found in my collection, as the small amount of flour in it, can easily be replaced with rice flour. Thanks to the ground almonds and grated courgette the cupcakes will still be light and moist. Preheat the oven to gas mark 4 and line a muffin tin with paper cases. Mix the almonds, flour, baking powder and salt together in one bowl until all is well combined. In another bowl, whisk the eggs and sugar with an electric whisk for at least 3 minutes, until they are pale and fluffy. Add the grated courgette, along with the vanilla extract and whisk them both in. Add the almond-flour mix to the egg-sugar one and whisk everything together for a well-combined cake mix. Ladle the mixture in the paper cases, using around 1 ½ tablespoon of cake mix per case. Top each with a teaspoon of strawberry jam and cover the jam with the rest of the cake mix (you should have roughly 1 tablespoon cake mix per case left for this). Place the tray in the oven and bake for 20 minutes until the cupcakes get a light golden colour. Cool them in the tin for 10 minutes, then continue to let them cool down completely on a wire rack. For the icing, blend the softened butter with 50g of the icing sugar in one bowl. I find it easiest to do this with a wooden spoon – it can be a bit of a work out but you’ll get there in the end. In another bowl blend the mascarpone with another 50g of the icing sugar – again using a wooden spoon. Combine the two, add the remaining 50g of icing sugar and stir again until you have one smooth icing. 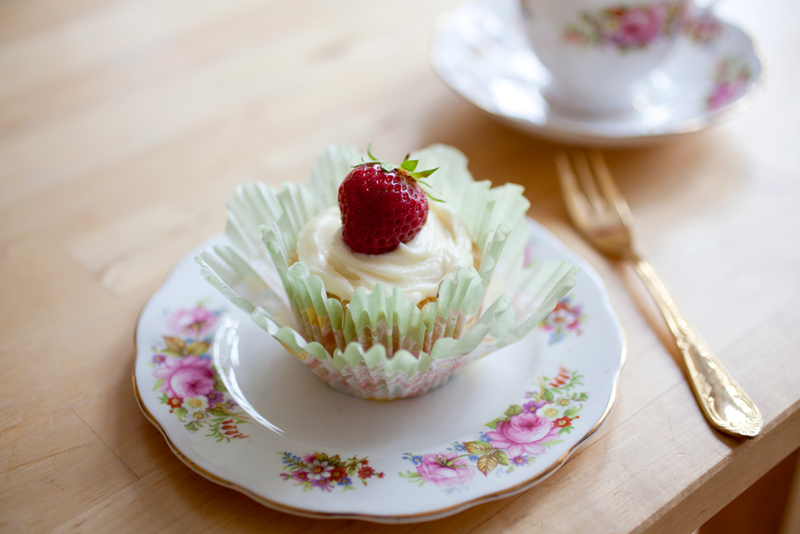 Spread a tablespoon of icing on each completely cooled down cupcake and place a pretty strawberry on top. Keep the cakes in the fridge until you eat them. This entry was posted in Cupcakes and tagged afternoon tea, breakfast, brunch, cake, courgette, cupcake, cupcake recipe, delicious, dessert, easy, easy recipe, eggs, gluten free, Jam, lowcal, lowfat, pretty, recipe, St Dalfour, StDalfour, strawberry, super easy, sweet, sweet cupcake, tasty, treat, vegetable cake, vegetable in cakes, zucchini. Bookmark the permalink.